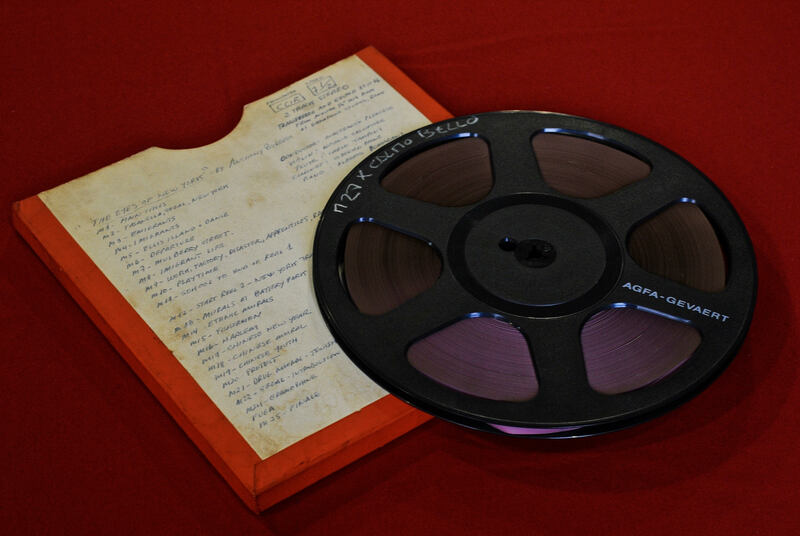 Deep in the Burgess Foundation collections is a treasure trove of reel-to-reel tapes and films in now obsolete media. We have managed to digitise some of this valuable material but much still remains to be discovered. 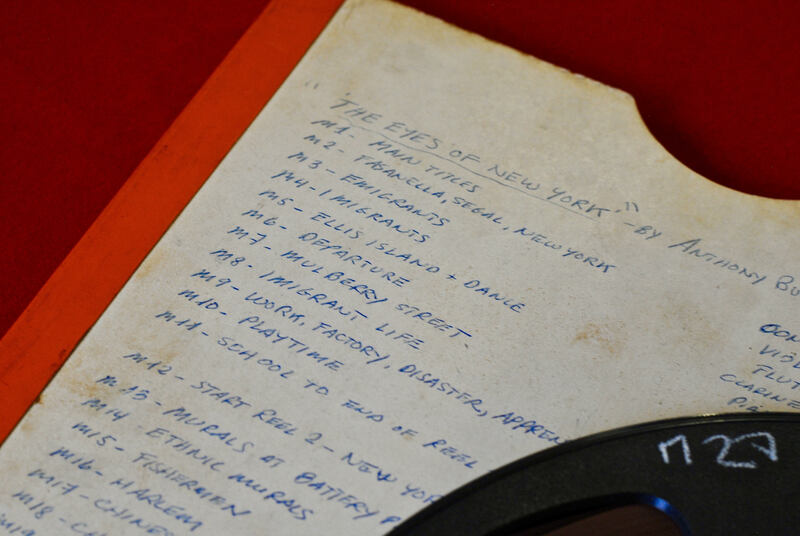 One particularly intriguing item is this tape labelled ‘The Eyes Of New York’ by Anthony Burgess. According to the label, this appears to contain a complete recording of the music for a film, scored for flute, clarinet, violin, cello and keyboard. Burgess describes this Italian film project, titled Gli Occhi di New York, in the second volume of his autobiography You’ve Had Your Time. The publishing firm Mondadori had acquired a collection of film stock of scenes from American life, and Burgess and a film editor called Mike Billingsly were commissioned to devise an hour of material and for Burgess to compose a score to go with it. The project was completed in late 1976, but Mondadori abandoned its venture into the home video market and the film was never released. The track listing seems to indicate that the film aimed to show the richness and vibrancy of New York life, with particular focus on the immigrant experience: ‘Ellis Island’ was the main entry point for new arrivals to the United States between 1892 and 1954, and tracks called ‘Mulberry Street’ (a main thoroughfare in Little Italy) and ‘Chinese New Year’ perhaps match sequences exploring the diversity of New York City. Elsewhere in the collection is a MP3 of what may be part of this tape, which was kindly sent to us by an archivist at Kenyon College, Ohio. The Eyes Of New York is likely to have formed part of a broadcast on their campus radio station, WKCO, on 12 October 1980: perhaps Burgess lent them his own cassette of The Eyes of New York, which they then attempted to copy. Unfortunately this MP3 only contains the second half of the tracks listed on the reel-to-reel tape, and the quality deteriorates as the recording goes on. Below is an extract from this recording, including the songs ‘Murals of Battery Park’, ‘Ethnic Murals’, ‘Ficherman’ and ‘Harlem’. 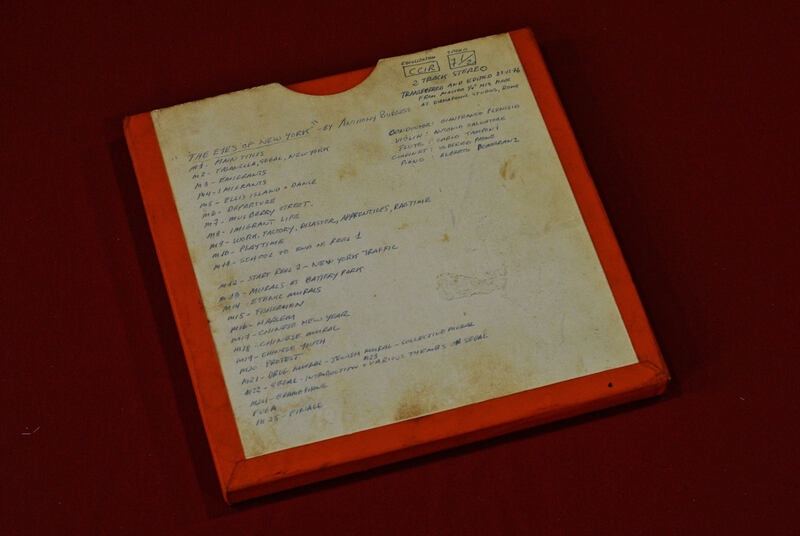 Separately, we have an audio cassette containing a number of songs from The Eyes Of New York introduced and played by Burgess himself at the piano: this may be a demo or similar, from Burgess’s directions to the musicians before they embarked on the full studio recording. While a script for the film exists, the score for this film music appears to have been lost, as has the video material: at least, none of the archives have yet discovered these parts of the puzzle. 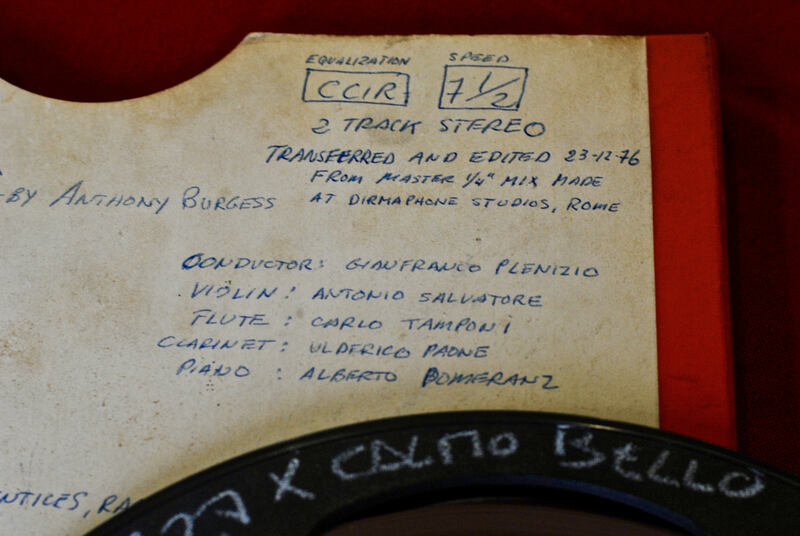 However, by piecing these fragments of audio material together we can increase our understanding of Burgess’s involvement in composing and writing for film. The next task is for us to find a way of listening to this previously unknown reel-to-reel tape.